There were several people in the combat community who were baffled at Ultimate Fighting Championship’s (UFC) decision to book Greg Hardy to co-headline UFC on ESPN+ — which is set for Jan. 19, 2019 — the same card Rachael Ostovich will face Paige VanZant. Hardy was the center of attention a few years ago for a domestic violence dispute that ultimately cut his NFL career short, paving the way for him to pursue his mixed martial arts (MMA) dreams full time. Ostovich, meanwhile, is the victim of an alleged domestic abuse case at the hands of her husband late last year. Ostovich admits she really didn’t give the situation too much thought initially, saying it was social media that eventually brought it to her attention. “I remember waking up to all kinds of stuff on Twitter wondering, ‘What is this, what in the world?’ I really didn’t look into it too much because I was busy dealing with my own thing, my daughter and life goes on. I started getting calls and people reached out to me,” Ostovich recalled during an interview on Ariel Helwani’s MMA Show. While her case is still ongoing, Ostovich says she is too busy to be worrying about the personal and legal situations of others, but says everyone deserves second chances. And just like Hardy is turning his own life around, Ostovich hopes her husband — Arnold Berdon — can do the same. Referring to Dana White as a compassionate “uncle” who was very interested in her thoughts of fighting alongside Hardy after she did her homework and found out his backstory, Ostovich couldn’t help but to commend her boss in the handling of the whole situation. White has claimed that Hardy has already paid his dues and dealt with enough criticism regarding his domestic assault case, and like Greg, everyone needs to find a way to move on and not keep dwelling on his incident. 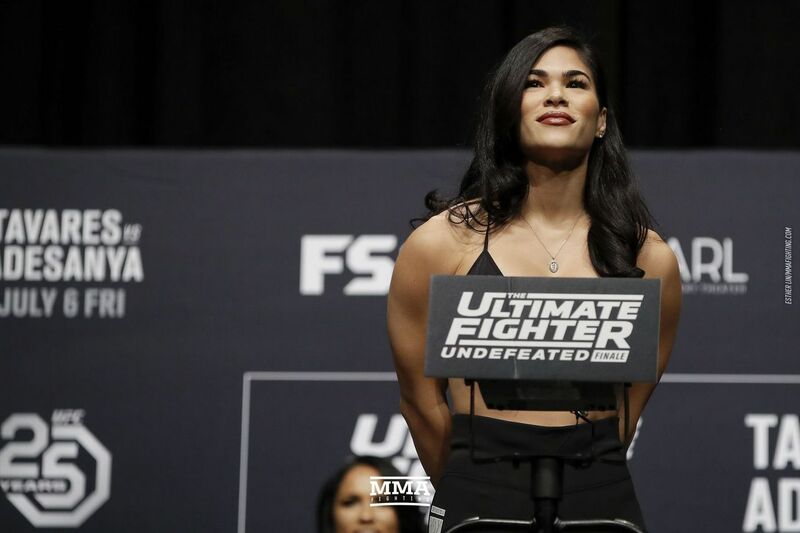 As for Ostovich, she is trying to do the same, and though she wouldn’t reveal any new details about the alleged assault she suffered at the hands of her husband, she feels stepping into the cage against Paige is good step forward in getting through her own domestic abuse obstacle. 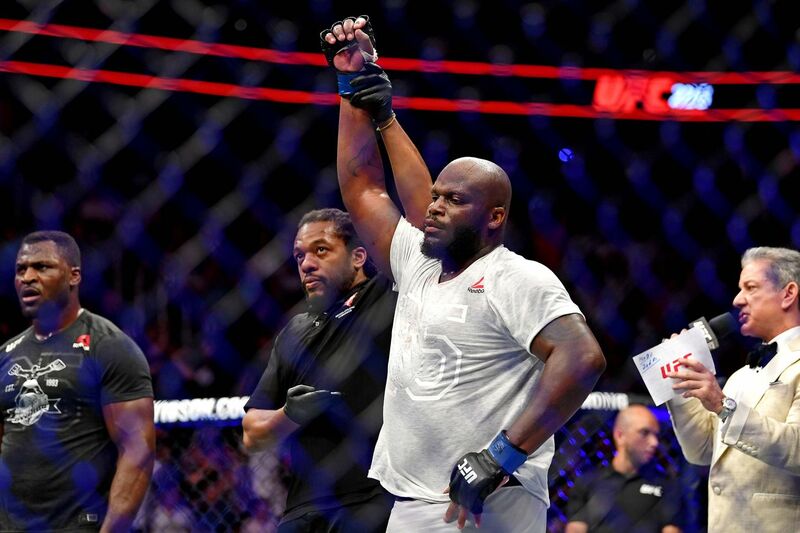 Ultimate Fighting Championship (UFC) Heavyweight sluggers Francis Ngannou and Derrick Lewis battled last night (July 7, 2018) at UFC 226 from inside T-Mobile Arena in Las Vegas, Nevada. Bad blood and massive power? Sounds like a recipe for a fun fight. Some fans may decry Ngannou as exposed after his difficult loss to Miocic, but a young fighter getting soundly beaten by the champion of the division is hardly career-ending. To get back into the title mix, Ngannou just had to land another knockout. Of course, Lewis was coming for the Cameroonian’s chin as well. The bruiser may not be the most technical athlete, but none could doubt his brawling prowess. After a long feeling out process, Lewis scored first with a nice body kick and right hand. Lewis continued to work with kicks, while Ngannou stalked and waited for his opening. There were 90 seconds remaining in the round when Ngannou finally threw his first strike, a jab which came up short. Not that Lewis did much more, but he did land some decent kicks and threaten with power punches. Realistically, the first round was a giant feint contest, but Lewis definitely won it with his slightly elevated rate of activity. Ngannou was a bit more active with his jab to start the second, but it was still a literal staring contest for large portions of time. Ngannou attempted his first real takedown of the fight nearly two minutes in with no success. Otherwise, it was the battle of the occasional jab vs. the occasional kick. The world kept hoping it would improve, but Ngannou did almost nothing for the entire five minutes. Lewis did slight — SLIGHTLY — more, so I guess he was up two rounds to none. Neither man made any adjustments to begin the third round. Actually, Ngannou threw a few more kicks, none of which did anything significant. I’m really struggling to write anything more about the action because almost nothing happened. Lewis mixed in a couple flurries that sort of saw some body punches land. Is there anything to talk about in a fight where only 30 something strikes were landed in 15 minutes? That’s an abysmal rate. It was a terrible, miserable fight where almost nothing happened. If there’s anyone to defend, it has to be Lewis. Lewis has long suffered back spasms — it once cost him a fight the day of the bout — and it seems that Lewis was dealing with that injury during the fight. Even with that issue, Lewis forced the issue a bit more, throwing and landing double the strikes of his opponent. A miserable win is a miserable win. There’s no defense for Ngannou. “The Predator” may have lost last time out, but at least he was swinging for the finish until the final bell. This was far more devastating to his reputation, and the UFC needs to throw him a softball next time out so that he can hopefully rebound. Last night, Derrick Lewis somehow won a slow-paced decision. What do you make of this bizarre fight? For complete UFC 226: “Miocic Vs. Cormier” results and play-by-play, click HERE! 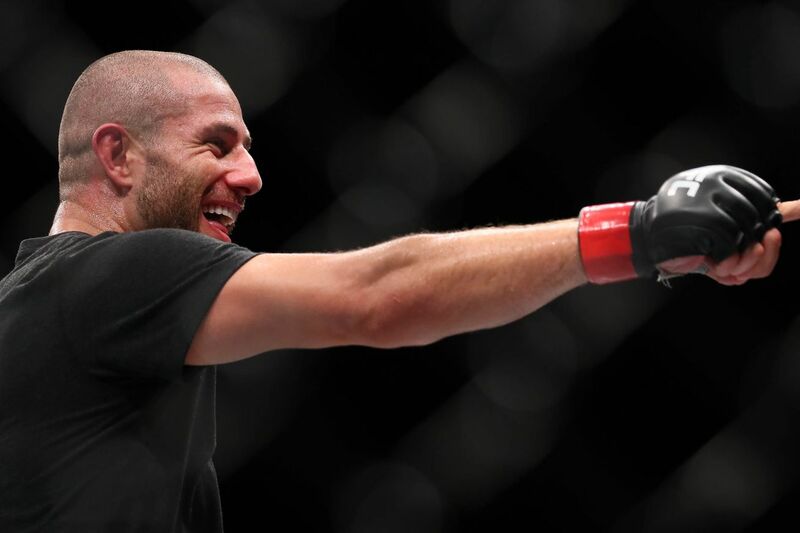 Gokhan Saki will look to make his long-awaited return to action this Saturday night (July 7, 2018) when he faces Khalil Rountree in a Light Heavyweight bout, which takes place on the main card of the UFC 226 pay-per-view (PPV) event. Though Khalil has won his last two fights via first round knockout, Saki isn’t sold on Rountree’s level of expertise when it comes to the art of standup fighting. “Everybody says he’s a standup fighter, and for me, I think he’s trying to stand up. People don’t understand standup fighting, so they’re really excited about the way he’s fighting. But I think everything is OK, you know?” declared Gokhan during a recent chat with Bloody Elbow. Saki, meanwhile, knows a thing or three about the art of striking on the feet, as the former world kickboxing champion made a name for himself taking on and defeating the best in the world before making a full time transition into MMA. And after a few exchanges, Saki says Rountree will quickly turn into a wrestler. “I think when they see my standup compared with his, then they’re gonna see what’s real standup fighting. So for me, maybe he don’t wanna stand up with me, he’s gonna try to wrestle with me or he’s gonna try to do Jiu-Jitsu with me,” he added. “Well, I don’t think he has the quality for that, you know? In a short time, to learn this all, to bring this all together. “Turkish Tyson” made good on his UFC debut back in September of 2017 by knocking out Henrique da Silva in the very first round at UFC Fight Night 117 (see it again here). Rountree, meanwhile, has won two in a row, as his previous loss to Michał Oleksiejczuk was overturned to a no contest afer Michal tested positive for clomiphene. While Dana White had designs on adding Georges St. Pierre vs. Nate Diaz to his ideal UFC 227 card, it appears that neither fighter is much interested in the booking.